Well, this is the last of the verity case of pumpkin ales. I not sure if I saved the best for last but I know by the title this will be the most unique. I’ve never had nor have I ever heard of a Pumpkin Stout before so this will be interesting. Pours black, stout black and completely opaque with just a tinge of light trying to show through the bottom of the glass. The beer has a very rich fluffy tan head with just a few soapy bubbles in it. This smells like a sweet stout with a light hop presence. There is just a slight hint of pumpkin on the nose along with those classic roasted malt aromas. That’s a nice tasting stout with just a hint of pumpkin on the back end of the finish. This is nice, very nice indeed. This is a very good stout. Classic roasted malt flavors up front with a dry finish with notes of chocolate and pumpkin. The pumpkin and spice flavors on the back end of the taste are very pleasant, smooth and natural tasting not artificial at all. This beer also has a very surprising dry finish like a like and dry Irish stout. Well, lets see what happens after this warms up a little. This is one of those beers that just keep getting better and better as they warm up. It is even smoother now at 64 degrees. The head has diminished to just a small ring around the class and little to no lacing. Since I only have this one I’m trying to nurse this for as long as I can. It’s now pretty much at room temperature at 68 degrees and it still has a lot to give. This is still an easy drinking beer with a nice smooth roasted chocolate malt and pumpkin finish. The very last couple of sips were a little sweeter than it was earlier. Wow, what a pleasant surprise to find this beer so enjoyable; I just didn’t know what to expect from a pumpkin stout. This is a very good beer; pumpkin ale or a stout. It has very nice natural pumpkin flavors and it is a very good dry stout. I recommend this to anyone that likes a good stout. As a stout the pumpkin flavors are subtle and natural tasting and it has all the other qualities of an excellent dry stout. 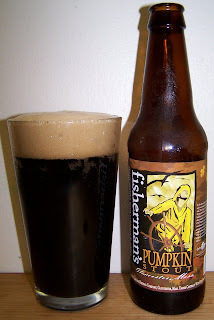 Any pumpkin ale lovers that like a well crafted pumpkin ale even if it is a stout will also like this beer. I almost feel I need to give this two ratings one for a stout and one for a pumpkin ale. I think I’m going to have to give this an A. An overall excellent stout that is also a very good pumpkin ale.